It's Honda's technological tour de force. A hybrid that provides exhilarating performance and fuel efficiency. 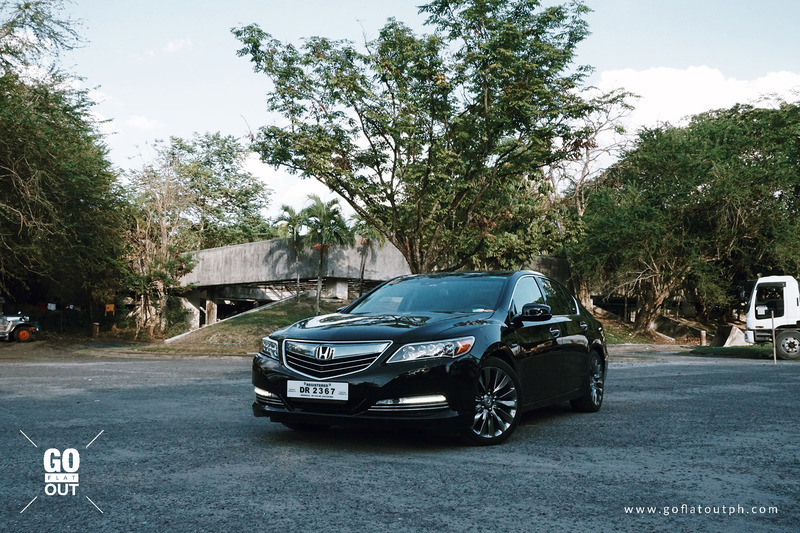 While most car enthusiasts would look at a hybrid car and its driver with scorned expressions, this maybe a different case for the Honda Legend. It may be true that some of the early hybrids could hardly get out of their own way, but in the last couple of years, these cars are coming into their own as performance machines, yet still providing exemplary fuel economy. The Honda Legend is aimed at vehicles like the Audi A6, BMW 5-Series, Mercedes E-Class and even the Lexus GS. In almost every category the Legend falls short, but do not fret. Out of all the cars I’ve mentioned, the Legend is up there in terms of handling and ride comfort. The Europeans may have the image and the prestige associated with their badges, but the Legend is absolutely in touch with its performance lineage. Show the Legend some corners and it will surprise you. Unusually for a hybrid, the theme of the Legend is a combination of sportiness and luxury with a healthy dose of efficiency thrown in. On the outside, there are basically zero indicators that you’re driving a hybrid, apart from subtle hybrid badging on the fenders. The black sparkling paint is a good starting point of its elegant and sophisticated design. Its 19-inch alloy wheels fit nicely with the rest of the body, giving it a planted stance thanks to minimal wheel gaps. Up front, it has these snazzy set of Honda’s (or Acura’s) trademark Jewel Eye LED headlamps, and the grille compliments nicely with the headlamps. Taken as a whole though, nothing about the Legend’s looks scream special. It easily passes on as any nondescript Japanese saloon. Without looking at the car closely, it could easily be passed on as a Honda Accord. As a full-size flagship sedan, the Legend certainly possesses the comforts expected from such a class of car, though like the exterior, the interior is far from being considered distinctive. There’s a healthy dose of wood, leather, and metal trimmings, which are all expected at this price point, but the overall interior design is best described as conservative. Confusingly, Honda has thought that it’s a good idea to fit a twin-screen infotainment system, which as a whole, works quite confusingly. 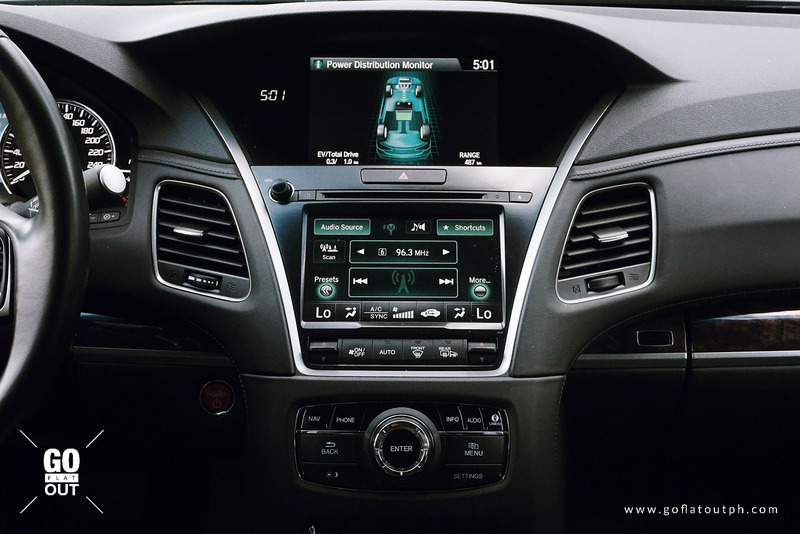 The infotainment system is controlled via either the touch screen with haptic feedback, or the rotary knob controller that mainly controls the upper screen. Thankfully, audio files played through the 14-speaker Hi-Fi sound system from Krell sounds crisp. It does a good job of making compressed MP3 audio sound like high resolution FLAC. What we do heavily appreciate are the electrically adjustable front seats, which feature both heating and cooling, and proved to be useful in a hot climate like ours. 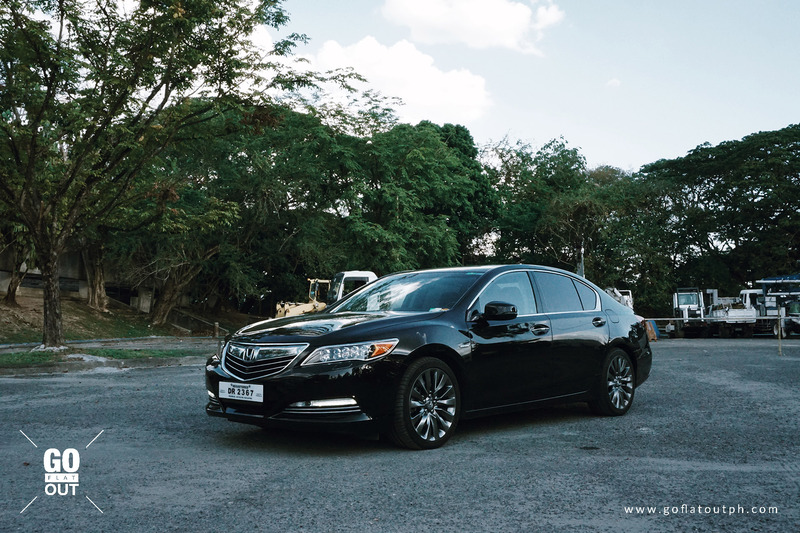 Being a full-size executive saloon, the Legend will mainly be chauffeur driven around Manila’s financial districts, with their bosses seated at the back. 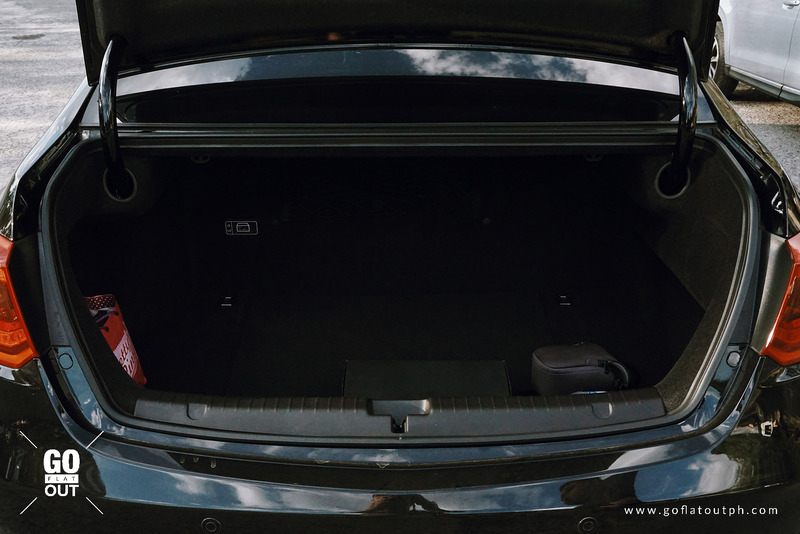 As such, you might expect that it packs a lot of goodies for the rear occupants, but unfortunately, this isn’t entirely the case. By reshuffling your expectations, the Legend is mainly a more driver-oriented luxury sedan. Up front, there are definitely a lot of toys to play with, but the back seat executive will realize that the toys at the back are quite limited. 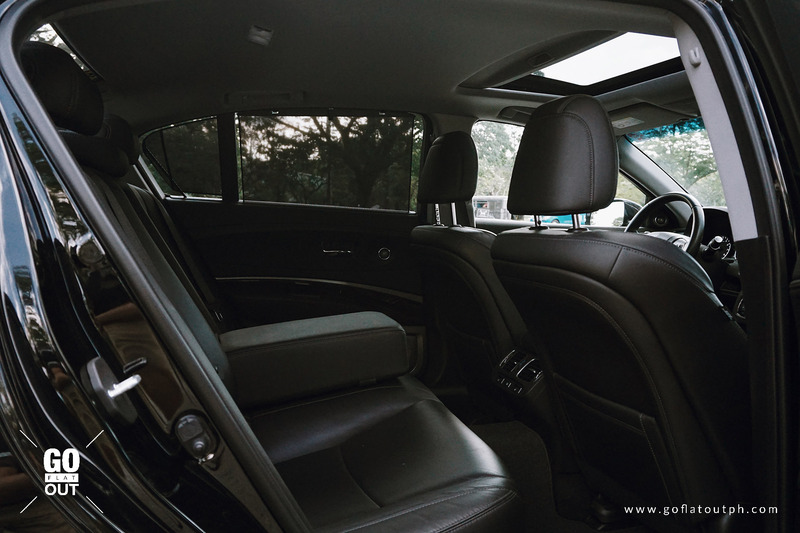 Sun shades, a center armrest, and a rear climate control system only seem to be the features that the back seat executive can enjoy. There’s also seat heating at the outboard rear seats, but we wish it featured seat cooling instead, since who uses seat heating in a country like ours anyway? Because the Honda Legend is a hybrid, a compromise certainly needs to be made in order to make room for its lithium-ion batteries. Consequently, the rear seats can’t be folded down for interior flexibility, and only 340 liters of space is on offer, which is tiny, especially considering that the smaller, subcompact (B-segment) Honda City offers 510 liters of space. As you press the start button, you are then greeted by mere silence. Only a whirr of the electronically adjustable steering column breaks the silence as it lays down on your hands. Being a hybrid, the engine doesn’t kick-in upon start up. It’s only on the move or when the batteries are low on juice when the 3.5-liter i-VTEC V6 starts up. Speaking of the engine, it can deactivate half of it’s cylinders when power demand is low. Working in tandem with the V6 and the 7-speed dual-clutch transmission are thee electric motors, one working together with the engine up front, and two individually powering each rear wheel. The electric motors can work independently from each other to provide drive torque, energy recuperation, reverse torque, or even zero torque (when declutched from the motor for free-wheeling). Taken as a whole, the Legend has a total system output of 377 hp @ 6,500 rpm and 462 Nm @ 4,700 rpm when all three motors are boosting the V6 engine. For short distance intervals, the Legend can be driven with just the electric motors. In addition to providing boost, the rear wheel electric motors effectively make the Legend an all-wheel drive vehicle without having the need for a center differential, while the resulting torque vectoring capability from the SH-AWD system enhances the car’s dynamic agility. Driving around the city under extremely light throttle, it is insanely quiet, which is further emphasized by the car’s excellent sound insulation. 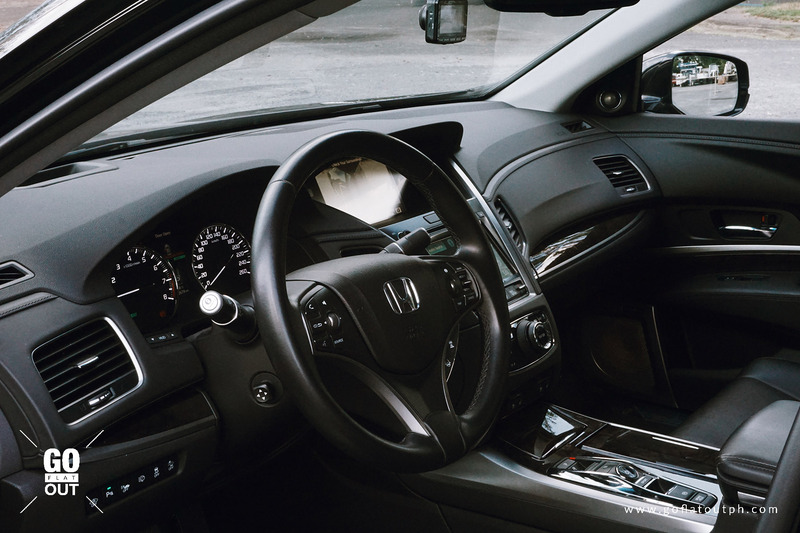 Along with its double layer glass, flat underbody, and well insulated engine bay, the Honda Legend is supremely cocooned from the hustle and bustle of the outside world. Quite spooky, as your only indication of speed is through the heads up display and speedometer. Once you put your foot down at full beans, it will sprint effortlessly in true VTEC form. Or should I say, VTEC KICKED IN ‘YO! Under full throttle, the Legend displays a very different character from its otherwise calm and refined nature. Despite the 1.9-ton weight, this car is quite a blast to drive fast. The way it turns and responses make it feel a lot smaller than its size suggests. The electric motors work independently to provide torque vectoring on each wheel, even individually reversing the torque on the inner wheel under hard cornering to make this large sedan rotate better. Even on damp surfaces, the car refuses to lose traction. There is also a driver selectable Sport mode that changes the way the gears change up and down and adjusts the electrically assisted steering for a sportier drive. Paddle shifters also provide a nice way to control the car’s transmission manually. Though the steering is devoid of any feedback, it is nevertheless quite responsive and accurate. If there’s anything that people might need some getting used to, it would be the Legend’s brakes. The touchy nature of the brakes is due to the hybrid system’s regenerative braking that recuperates power by converting kinetic energy to electrical energy to charge the batteries. Credit to its ride and handling also goes to its independent double wishbone front and independent multi-link rear suspension, which both feature amplitude selective dampers for excellent ride and handling. The Legend also comes with a wide range of electronic driving aids, all designed to enhance active safety. 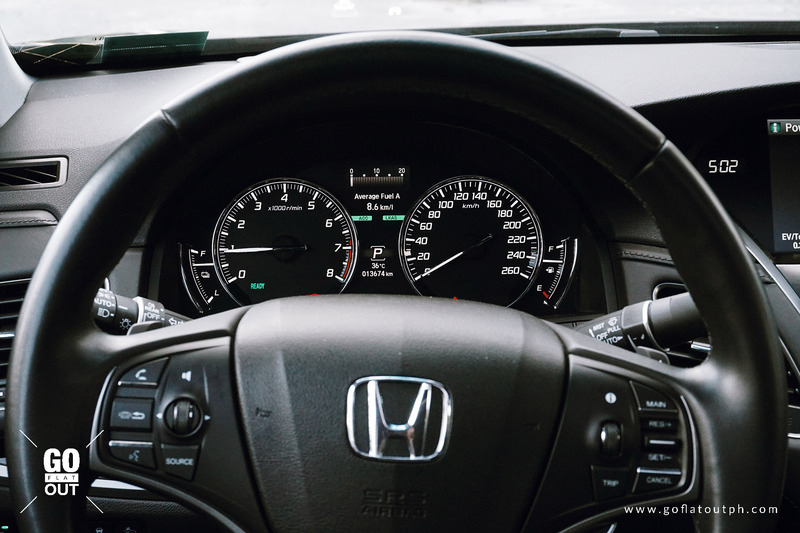 There’s a number of abbreviations for the different features of the Honda Sensing safety suite of technologies, such as CMBS (Collision Mitigation Braking System), LKAS (Lane Keeping Assist), RDM (Road Departure Mitigation), and Blind Sport Information System with Rear Cross Traffic Alert. This is on top of the four cameras that the Honda Legend already has that provide a 360-degree view of the vehicle in low speed maneuvers. Most diligent of the safety equipment is CMBS, which not only applies braking force, but also taps the accelerator pedal back at your right foot and tugs the seatbelt if you approach the vehicle in front at a speed considered unsafe by the system’s control unit. It can be useful in many situations, but also annoying when it is unnecessary. Upon going down a crest on the road, the Legend thought that we were going to crash into it, beeping and tugging the seatbelt as we merely just drove on it. There is also radar-based Adaptive Cruise Control with Low Speed Follow, which lets the Legend drive itself on the highway, even through traffic jams. This proved very useful when driving in NLEX traffic, when a number of fender bender incidents brought traffic flow down to a screeching stop. The system autonomously brings the car even down to a full stop, and resumes its operation as the car in front starts moving again, continuously following it up to a minimum distance to the car in front and up to a maximum speed that you set it to do. It’s a very convenient feature, and is a clear indication of the autonomous driving future we are headed to. Lastly, there are a set of cameras to remind you that you are piloting a large sedan. As you slow down, the cameras in the sides of the car automatically activate so that you are wary of the Legend’s dimensional clearances. During our time with the Legend, we managed around 8.6 km/l as we thoroughly enjoyed its exhilarating performance. This can even get better on the highway. With Adaptive Cruise Control turned on, which we found out to work surprisingly well, taking the sting out of NLEX traffic, the fuel economy increased to as much as 15.3 km/l. Under light throttle applications in traffic, the Legend coasted often in pure electric mode, which helped boost its fuel economy. The Honda Legend’s Sport Hybrid Super Handling All-Wheel Drive (SH-AWD) system and chassis do not just put it ahead of the mainstream luxury competition in terms of technology and capability, it also gives it levels of performance and dynamics that are rarely seen in this category. Even so, with it’s P4,380,000 price tag, the Legend has a formidable task of taking on the competition. 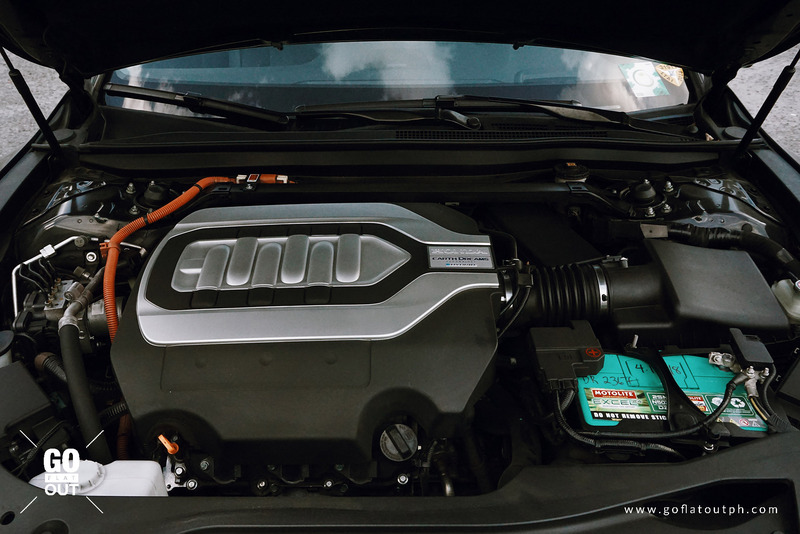 While the Germans offer a midsize sedan with a generic 4-cylinder diesel powertrain, the Legend is able to compete with a sophisticated, high performance hybrid powertrain that offers loads of power and refinement. Overall, it’s a great car to drive, but it can’t really match it’s German rivals in terms of luxury and presence. What it does offer though is a showcase of Honda’s technological tour de force. A taste of the company’s top tier technologies that will one day eventually trickle down to its more mainstream vehicles, and it’s an exciting sign of things to come. The Legend is not for everyone, and just like any early adopter to technology, it is only for those who appreciate the art in engineering and technology.